Sorbet without an ice cream maker? You bet! 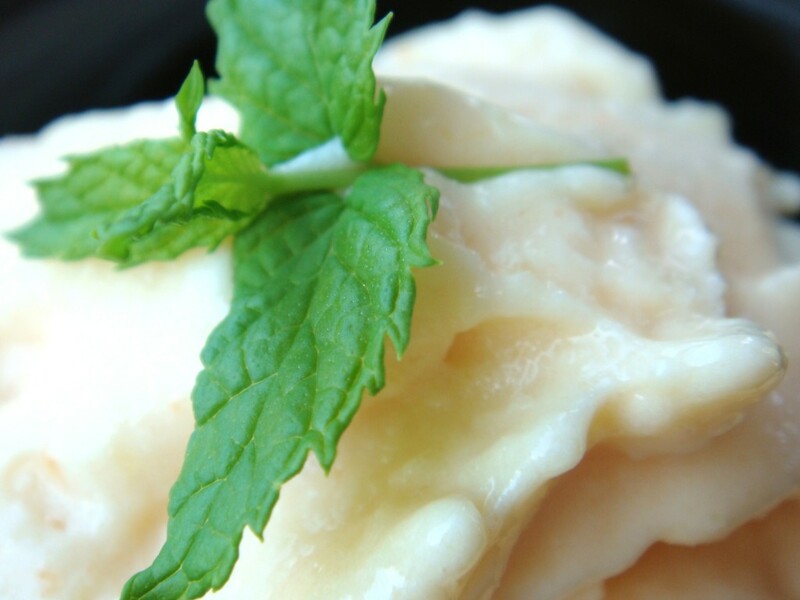 So you want to make homemade sorbet — but you don’t have an ice cream maker OR room in your freezer for a square baking dish? No problem! As long as you have a food processor, that is! This recipe was taken from Mark Bittman’s book Food Matters — A guide to conscious eating. I really like this book and plan to devote an entire post to it… but for now, a recipe to cool you off during these hot summer days. A recipe that not only tastes refreshing and delicious… but is fat free, sugar free and gluten free!!! 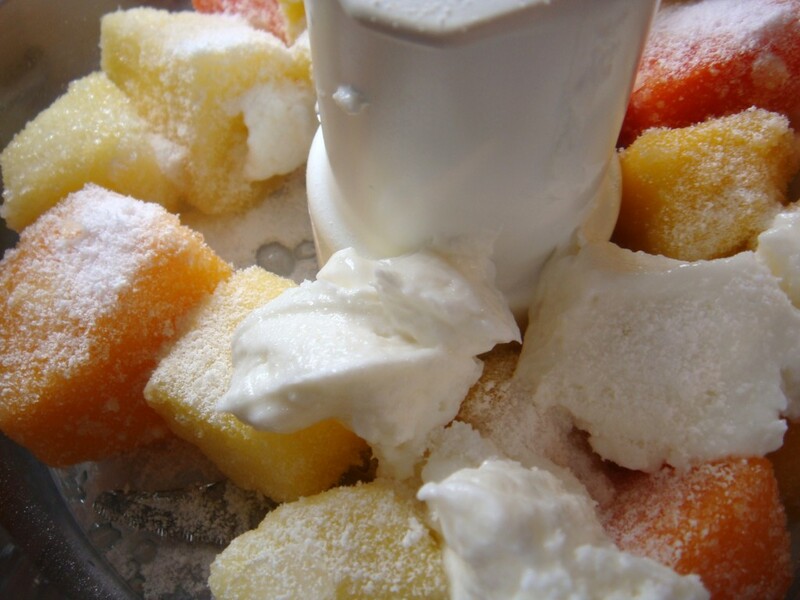 Put all the ingredients except the water into the food processor and process until pureed and creamy. Add water as needed to improve the consistency and stop occassionally to scrape down the sides. Be careful not to over-process the sorbet into liquid! Serve immediately or freeze. 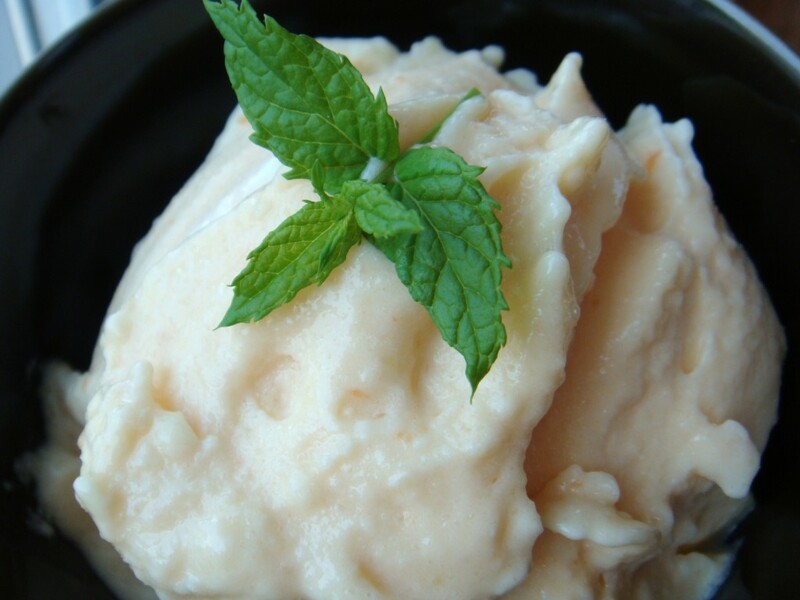 To serve later, just allow 10 to 15 minutes for the sorbet to soften at room temperature. This was the finished product… and it was delicious. It was a tad bit tart, b/c I didn’t add quite a 1/4 c of Splenda and I used the plain Greek yogurt (which is more sour than regular yogurt). With vanilla fat free yogurt, this would have been great. It seriously had the exact consistency of sorbet… and it was essentially nothing but fruit. I think next time instead of just a garnish, I will actually puree the mint along with the fruit. I think it would be a great mix. I was also thinking frozen cantaloupe with basil would be delicious. Any other ideas for fruit and herb combinations? Perhaps strawberry and basil? Bittman suggest honeydew or cantaloupe with a squeeze of lemon or lime; banana with a squeeze of lemon to prevent browning; cucumbers with a bit of jalapeno; and for a chocolate-cherry sorbet, skip the sugar, add 4 oz of melted bittersweet chocolate and use 12 oz of frozen cherries (which Trader Joe’s carries).